Some minahasan or manadonese food such as ayam rica-rica or bubur manado (tinutuan) are very well known. But only few know about rica rodo. From its first word 'rica', it is supposed to be spicy. Yes, it is. 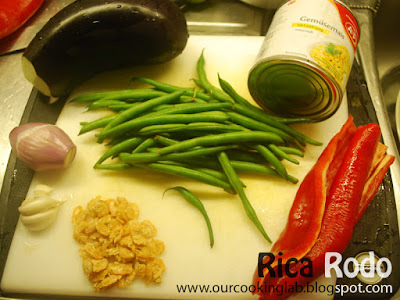 But it is far from ayam rica-rica, because rica rodo is a vegetable dish. This is not original rica rodo recipe. Some of the ingredients are not used or replaced by substitutes due to avalabillity or economical reasons. For example, long beans are substituted by green beans (french beans), smoked roa fish is substituted with ready made sambal ikan roa (bought in Manado), big red chillies are substituted by long red paprika. I use powder lemongrass instead of the fresh one. When I searched in internet I found there are a lot of variations of ingredient combination were used in the recipes. So I decided to make the recipe based on my remaining taste memory of rica rodo. Fishy smell ingredients. In this case I use dried ebi and sambal roa. Here you are, my highly modified rica rodo recipe that bring me back to Manado for a few meals..
Heat oil in a big frying pan or medium size pot over high heat. Saute shallot and garlic until fragrant. Add red long paprika (or big chili),small chili, and sambal roa, saute for 1-2 minutes. Add the rest of spices. In this case: lime leaves and lemongrass powder. 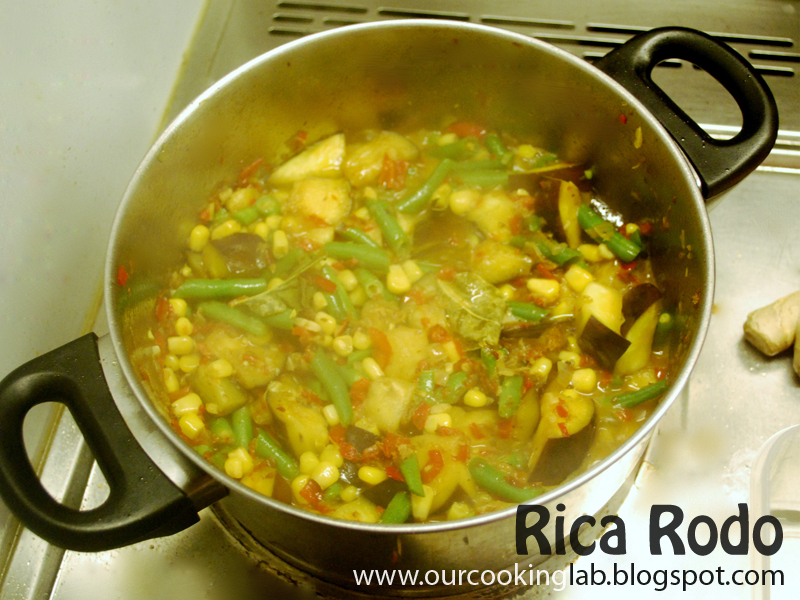 Add the green bean, eggplant, and corn. Stir until well mixed with the spices. Add a little bit of water if the mixture is too dry. Cover the pan or pot and cook for 1-2 minutes until all of the vegetables and corns ar well cooked. Add scallion, stir, and rica rodo is ready to be served for 5-6 person. This dish is very suitable to be enjoyed with warm plain white rice. If you love hot or spicy food, just add more small chili or finely chop them into smaller pieces instead of only half them.